If you’re visiting Salt Lake City or anywhere else in Utah, you’ll likely need a reliable way to get around the area. At www.affordablerentacarandsales.com, we have a large selection of cheap SUV rentals and other vehicles available. Make a reservation online, or contact us at (801) 266-7368 for more details about our services and any available SUV rental deals. 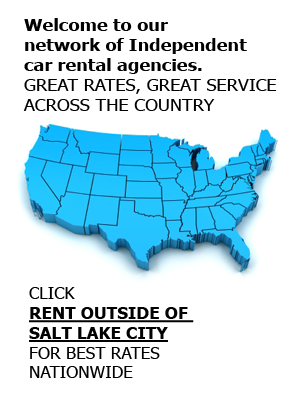 As a local, family-owned business, Affordable Rent-A-Car And Sales makes it easy for travelers and residents of Salt Lake City to get a deal. We have competitively priced our vehicles, including our SUV rentals, so customers don’t have to empty their wallets just to get to their destination. Save your funds for more memorable activities and still travel comfortably in a reliable sport utility vehicle. There’s no question as to where the action is in Utah: Salt Lake City. The area boasts some of the best attractions, restaurants, and ski slopes. If you’re planning a vacation into SLC, you’ll find the information at www.visitsaltlake.com to be helpful in creating your itinerary. Put a ski rack on the top of your SUV rental and make the most of the slopes, or take a group trip to Yellowstone and have the extra luggage space and legroom for your family. No matter your destination, you can expect the best with a cheap SUV rental from us. Stylish, spacious, and modern, all of our vehicles are well-maintained and cleaned regularly for your satisfaction. Families on a stricter budget that are looking to take a fulfilling trip need not look further than Affordable Rent-A-Car. Along with SUVs, we also have a variety of vans, trucks, and car rental options in our fleet. Call us at (801) 266-7368 to reserve a cheap SUV rental or speak with an agent about any of our services, including airport car rentals, used car sales, and production rentals.